CocoUrth coconut charcoal in the Cube version is available in a 18 Piece Box, 72 Piece Box, 144 Piece Box, as well as a 720 Piece Box. 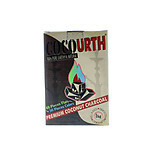 The CocoUrth Cube version 72 Piece Box allows for you to stock up on this authentic Coconut Charcoal at a reasonable price. It is recommended that you heat the charcoal on an electric stove or open flame before every smoke.